Just being awake can be a miracle. "Hello. My name is Leonard Lowe. It has been explained to me that I've been away for quite some time. I'm back." 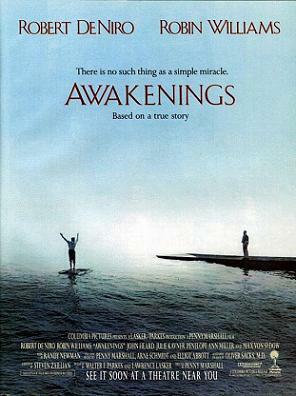 Awakenings is a 1990 drama film based on Oliver Sacks' memoir of the same name. It tells the true story of a doctor (Sacks, who is fictionalized as Malcolm Sayer, played by Robin Williams) who, in 1969, discovers beneficial effects of the then-new drug L-Dopa. He applied it on catatonic patients who survived the 1917-1928 epidemic of encephalitis lethargica. Leonard Lowe (played by Robert De Niro) and the rest of the patients were awakened after decades of catatonic state and have to deal with a new life in a new time. Directed by Penny Marshall, the film stars Robert De Niro, Robin Williams, John Heard, Julie Kavner, Penelope Ann Miller, and Max von Sydow. The film has a cameo from jazz legend Dexter Gordon (who died before the film's release) who appears as a patient, and a then-unknown Vin Diesel plays a hospital orderly. The screenplay was written by Steven Zaillian, based on Sacks' book. The book was also used by Harold Pinter as the basis of his one-act play A Kind of Alaska, performed in 1982. A documentary by the same name, featuring interviews with Dr. Sacks and his real-life patients was produced by British television company Yorkshire Television in 1974. Dr. Ingham: Most died during the acute stage of the illness, during a sleep so deep they couldn't be roused. A sleep that in most cases lasted several months. Those who survived, who awoke, seemed fine, as though nothing had happened. Years went by — five, ten, fifteen — before anyone suspected they were not well...they were not. I began to see them in the early 1930's — old people brought in by their children, young people brought in by their parents — all of them complaining they weren't themselves anymore. They'd grown distant, aloof, anti-social, they daydreamed at the dinner table. I referred them to psychiatrists. Before long they were being referred back to me. They could no longer dress themselves or feed themselves. They could no longer speak in most cases. Families went mad. People who were normal were now elsewhere. Dr. Sayer: What must it be like to be them? What are they thinking? Dr. Ingham: They're not. The virus didn't spare the higher faculties. Dr. Sayer: We know what for a fact? Dr. Ingham: Because the alternative would be unthinkable. Downer Ending - Sort of. Basically, everybody given the drug eventually reverts back to their catatonic state no matter how much the dosage is increased. Real Life has another Downer Ending. Sacks got fired. Bittersweet Ending: But these people were able to enjoy their lives, and Sacks continued his success into the modern day. Fish out of Temporal Water: When taken out after being revived, the catatonics are pleasantly surprised to find that Prohibition ended a long time ago, but less pleasantly surprised by how old they are now. In fact, many of them still act as if they were not just in the 20s but in their 20s. Not That Kind of Doctor: The film begins with Sayer showing up for a job interview, not realizing they're looking for someone to take care of patients; he's a researcher, not a clinician. He takes the job anyway. Pyrrhic Victory: Even though the patients have been brought out of their catatonia temporarily, one patient is clearly upset about all the time he has lost. Anthony: [cheerfully] How's it going? Anthony: Yeah, how do you feel? Frank: Well, my parents are dead. My wife is in an institution. My son has disappeared out west somewhere. Frank: I feel old and I feel swindled, that's how I feel.